A pineapple bun is a kind of sweet pastry popular in Hong Kong, Macau, some other areas in southern China, and in Chinese communities in North America. They can also be found in bakeries in Taiwan. It is known in Cantonese as bo lo baau, in which "bo lo" means "pineapple", and "baau" refers to a kind of bun-like item in Chinese cuisine. It is commonly found in Chinese bakeries, and is mentioned quite frequently on TV, radio and films in Hong Kong. The top of the pineapple bun (the part which is made to resemble a pineapple) is made of a dough similar to that used to make sugar cookies, which consists of sugar, eggs, flour, and lard. As such, it is crunchy and is quite sweet compared to the bread underneath. The bread dough underneath is the same used in Chinese style Western breads, which is a softer and sweeter dough compared to Western breads. It is a popular pastry for breakfast or afternoon tea. 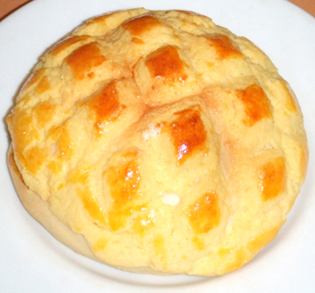 Although the pastry is known as "pineapple bun", the traditional version contains no pineapple. The name "pineapple bun" actually originated from the fact that its sugary top crust is cooked to a golden-brown color, and because its checkered top resembles the epicarp of a pineapple.